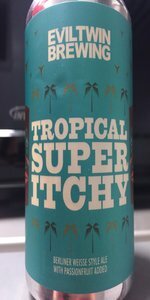 I like this one more than the regular Tropical Itch. It's that, but more. And more is always better when it comes to tart beers. Just wish it wasn't so ridiculously expensive. Ever get that super itchy sour taste that seems to stick in your crawl? It's one that's sweet, but sour, but biting, and makes you want to grind your teeth. It's something that's uncomfortably enticing, uncontrollably wanting, apprehensive and illusive? If so, then yes, Evil Twin Brewing hit all those chords with their probiotic heavy berlinerweiss with reckless additions of passionfruit. Foggy lemon tones frame a bright and glowing aesthetic range while a frothy stark white crown adorns its rim. Equally as bright, the scent is chocked full of citrus and tropic to tighten the jaws and strike the saliva glands with a mere whiff. Adorned with a faint fruity must, the tangy fragrance soon leads to a lightly candied taste of taffy, hard candy and lemon meringue. The taste quickly turns to a decidedly sour profile as it splashes the middle palate. Enlivened with the tropical zing of passionfruit, under ripened mango, kiwi, cantaloup and sour white grape, the taste is playfully acidic from fruit additions alone. Its underlier of sourness offers its own unique and face-sticking characteristics of crabapple, lime, lemon and dry white wine for a premiere sour taste that's just as complex as it is refreshing. Medium light on the palate, the "juiciness" of the ale seems to leave the mouth with a rich culinary delight. But its high acidity and piquant pectin bite accentuates dryness for a crisp, clean and refreshing session that trails with a soft earthiness of dry burlap and balsa. Moderate pour yields a one inch white head over a very slightly hazy pale golden body with some lacing. Nose of an exorbitant amount of passion fruit which is apparent upon opening the can. Flavor mirrors aroma with a wonderfully nice and refreshing sourness. Nice feel and overall, I certainly wish I had this in the summertime. Cheers! A can into snifter appears a hazy pale yellow with white cap that is quick to fade. It smells fruity like guava, pineapple, grapefruit and grass with a bit of cat piss and rubber which is pretty gnarly. It tastes catty and cactus/agava-like with a tart lemon backdrop that again is almost guava-like. This is light in body with modest carbonation. A decent brew. A thanks to the commander of the canquest, woodychandler, for this beer. Poured from a 12 oz. can. Ha sa hazy golden color with a 1/2 inch head. Smell is sour, passion fruit. Taste is of passion fruit, guava, some wheat, very sour and desert dry. Feels medium bodied in the mouth and overall, I'm not a fan of this style, but this one ain't bad. 12 ounce can into tulip glass, no can dating. Pours moderately hazy/cloudy pale golden yellow color with a 1-2 finger fairly dense and rocky white head with awesome retention, that reduces to a small cap that lingers. Nice spotty soapy lacing clings on the glass, with a fair amount of streaming carbonation. Aromas of big juicy/tart/tangy passion fruit, fruit skin, sour lemon, lime, peach, pear, green apple, mango, melon, guava, berry, white wine, hay, straw, grass, wheat, cracker, white bread, light pepper/lacto funk, and yeast earthiness. Damn nice aromas with great balance and complexity of fruity/acidic yeast, passion fruit, and moderate pale/wheat malt notes; with great strength. Taste of big juicy/tart/tangy passion fruit, fruit skin, sour lemon, lime, peach, pear, green apple, mango, melon, guava, berry, white wine, hay, straw, grass, wheat, cracker, white bread, light pepper/lacto funk, and yeast earthiness. Moderate fruity/lactic tart/sourness, fruit tang, and light yeast spiciness on the finish. Lingering notes of tart/tangy passion fruit, fruit skin, sour lemon, lime, peach, pear, green apple, mango, melon, guava, berry, white wine, hay, straw, grass, wheat, cracker, white bread, light pepper/lacto funk, and yeast earthiness on the finish for a while. Incredible complexity, robustness, and balance of fruity/acidic yeast, passion fruit, and moderate pale/wheat malt flavors; with an nice malt/sourness and tangy fruit balance. Lightly increasing pucker factor, but not overwhelming. Moderate increasing dryness from sourness and tangy fruit. Medium carbonation and light-medium body; with a very smooth, moderately crisp, bready, grainy, acidic, tangy, and tannic balanced mouthfeel that is great. Zero warming alcohol as expected of 4.5%. Overall this is a fantastic fruited Berliner weisse! All around outstanding complexity, robustness, and balance of fruity/acidic yeast, passion fruit, and moderate pale/wheat malt flavors; very smooth, crisp, and refreshing to drink, despite the increasingly acidic/tangy/tannic/drying finish. Outstanding balance between Lacto and fruit; with a solid pale/wheat malt backbone. A highly enjoyable offering, and spot on style example. man i dont know what this tasted like when it was brand new, but its done pretty well for itself in the can here over the time since its been brewed. its not got a ton of head on the pour, but the beer is plenty lively, and the tartness of the clean lacto and the natural passion fruit jump right out and accost my nostrils when i smell even gently, its highly fragrant and it makes my mouth water like mad. furthermore, there is a little funk to this, its not one dimensional mild sourness, its dynamic and compelling, really smells fantastic. the flavor is almost just as good, with a bold but natural passion fruit profile like the fruit itself, like tangy jelly on the inside and with a chardonnay wine sort of note past the middle leading up to the mineral sour finish. refreshing, not acidic enough to slow me down, and so flavorful, its great! better carbonation than it looks like it should have, and a lightness about it despite the relatively intense flavors. delicious, summery, and way more complex than a lot of these front end sours have been from evil twin. i really dug this one! Slightly hazy golden color with a bit of white foam. Aroma has intense tropical, tart passionfruit notes and lactic acidity but overall really clean. Taste starts sour up-front, dry, fruity, light background honey sweetness, lingering tropical lemonade aftertaste. Light body with medium carbonation. Really fresh, tart and tropical. Pours a hazy, bright yellow/gold colour. Smells tart, fruity, big passion fruit notes, and juicy. Tastes quite tart, lots of passion fruit, slight tangerine flavours, juicy, fruity finish. This may be the best relatively mass produced, fruited, berliner/gose I've had. Tons and tons of passion fruit complimenting an already tart beer, made this a very tasty (albeit expensive) treat. It doesn't get much better than this for a fruited kettle sour. Very impressed and I hope they release other variants in the future.